It started in Albuquerque, New Mexico in June of 2006, and the list of jurisdictions, in the United States, that have banned Retail Pet Stores from selling animals that don’t come from rescues, has continued to grow steadily. It’s these great laws that will help slow down the commercial breeding of companion animals. And it quickly showed that it was working, in Albuquerque with animal adoptions increasing by 23 percent, and the euthanasia at city shelter decreasing by 35 percent. Now, it’s a growing trend, that’s a real win for the rescue animals, and the rescuers that work with them. More than 200 cities and counties in the United States alone have passed ordinances that ban retail pet stores from selling companion animals from commercial breeders (dogs and cats mostly). Allowing instead, for pet stores to work with local animals rescue groups and shelters to help get the shelter pets adopted. Stop commercial breeding (aka Puppy Mills) of dogs. Most animal advocates will tell you that pet store sales of puppies encourage the breeding of puppy mill dogs. Commercial breeding facilities where dogs are kept, bred and raised, some for their whole lives, in small cramped and inhumane conditions. Rarely receiving any vet care or even human kindness. And rarely taking into consideration the health of the puppies being bred, leaving sickly “product”. Pet store sales bans help to cut down on the puppy trade by taking away the “demand” for the dogs. When the breeders can’t sell as many animals through retail shops, they can’t sell as many animals. Making commercial breeding less and less financially attractive. Along, slowly, with stricter and stricter laws regarding commercial dog breeding facilities, the pet store sales bans will help to take a bite out of the industry. California, Florida and New Jersey are leading the way with the most local pet store sales bans. 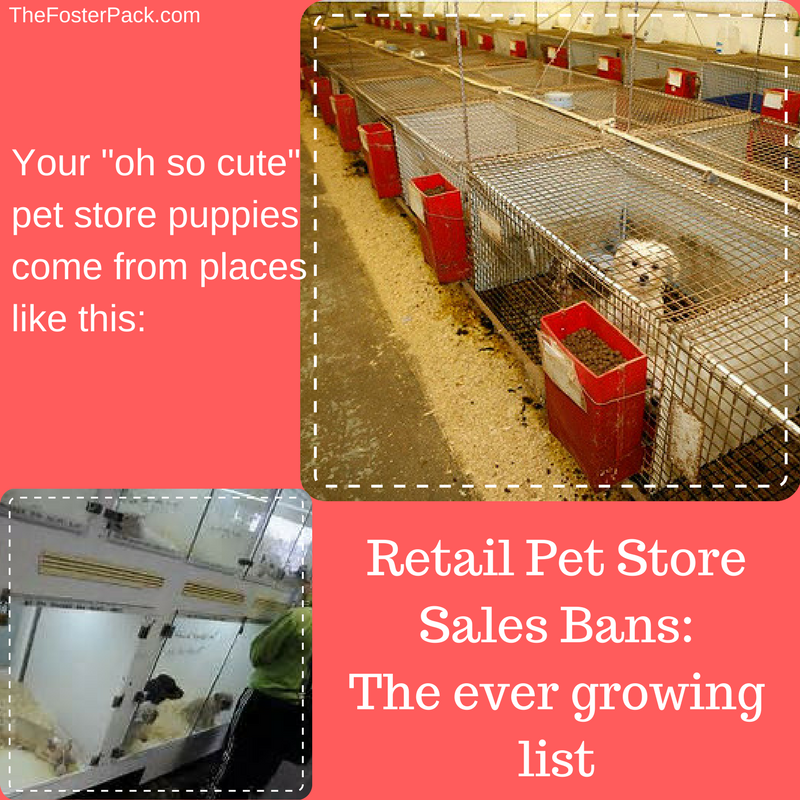 But lots of states have one or more jurisdictions that have passed pet store sales ban ordinances. Colorado, Georgia, Illinois, Indiana, Maine, Maryland, Massachusetts, Michigan, Minnesota, Nevada, New Mexico, New York, Pennsylvania, Rhode Island, Texas, Utah, and Washington. Let’s hope the trend continues. And more and more jurisdictions will enact retail pet store sales bans, and instead to help get shelter and rescue animals adopted! Tho some of us may not survive the cycle ‘ere it falls. If we don’t sell they will not need more puppies in these halls. And if they need no puppies then the Man will not bring more. Eventually it can all stop! You CAN close the door.